From Franklin Templeton Investments: In the latest edition of “Global Macro Shifts,” the Templeton Global Macro team examines the plans to start shrinking the US Federal Reserve’s (Fed’s) balance sheet and the potential impacts to financial markets. The team briefly outlines the global economic backdrop, then reviews the monetary policy normalization challenge, contrasting the set of expectations held by markets with the three factors it sees at play. For even more detail, download the full paper on this subject. The Fed has unveiled plans to start shrinking its balance sheet, which has more than quadrupled in size since the global financial crisis (GFC). The multi-year massive expansion of the Fed’s balance sheet has had a recognized powerful effect on asset markets–lowering yields and flattening the yield curve. Yet investors now seem to expect that the reverse process will have little impact, if any. We disagree. We believe three factors have the potential to push bond yields higher; any single one could be sufficient to push yields well beyond current market expectations, and we see very little chance that none of them will materialize. First, as the Fed reduces its purchases and the US Treasury increases supply to finance the ongoing fiscal deficit, new buyers must step in to keep the market for US Treasuries (USTs) in equilibrium. Our analysis shows that the burden will fall disproportionately on domestic, price-sensitive buyers like banks, mutual funds, pension funds and corporations. For these buyers to increase their demand, UST prices must fall and yields rise. Second, as the Fed unwinds its balance sheet in a gradual manner, banks’ excess reserves will remain extremely high for the next few years. A well-entrenched and strengthening economic recovery will give banks a growing incentive to increase credit supply–all the more so as financial regulations will likely be eased over the coming year. With stronger global growth and bolstered confidence, credit demand will also likely rise. This underscores the risk of a faster-than-expected acceleration in credit, which could further stimulate growth and raise inflation. Third, wage and price pressures are unlikely to remain muted as the US economy, having reabsorbed all economic slack, keeps growing above potential–and the global economy with it. We find arguments that the wage and price Phillips curves1 have permanently flattened unconvincing. Moreover, both wage and price trends have a strong global component, and inflationary trends in the global economy are now likely to get stronger. To assume that none of these three factors will come into play would be, we believe, foolhardy. As the Fed unwinds its balance sheet, we should ask not whether yields will rise, but how much faster and higher than market expectations. The global economy has picked up stronger momentum this year, with global gross domestic product (GDP) growth projected to step up to 3.6% from 3.2% in 2016, and to accelerate marginally over the next couple of years.2 Commodity-producing countries have benefited from the stabilization in raw materials prices, which helped Brazil and Russia come out of recession, the eurozone has been enjoying a robust cyclical upswing, India has maintained a robust pace, China should meet its 6.5%-7% target and the US recovery has proved resilient. Global trade has recovered to a 4%-5% annualized growth rate, from just 1% in the second half of last year, and global corporate profits have increased, driving a recovery in capital expenditures. Fears of deflation have been dispelled. After a slow-burning but sustained eight-year recovery, the global economy has largely repaired the damage of the GFC and ensuing Great Recession. Our baseline outlook, therefore, sees global growth marching at the current pace for the next few years, further eroding any remaining slack. The global recovery has been enabled by massive sustained monetary policy support in key advanced economies. Over the last eight years, the Fed has carried out an unprecedented experiment in monetary easing, combining a zero interest-rate policy with several rounds of quantitative easing (QE) that have driven a massive expansion in its balance sheet, which more than quadrupled in size between 2008 and 2014. Financial markets assume that the Fed will therefore be able to normalize monetary policy in a gradual and controlled manner: in particular, they seem to assume that wage growth and inflation have settled in to a permanently lower level; that money multipliers and credit growth will not accelerate; that only a few more interest-rate hikes will be needed; and that slow quantitative tightening (QT) will have limited impact on asset prices. Unwinding the asset side of the Fed’s balance sheet: As the Fed shrinks its balance sheet, it will significantly reduce its demand for USTs. As the UST market must currently be in equilibrium, we expect this to push yields up (the alternative would imply pent-up demand ready to step in, but if that were the case we should see downward pressure on yields). An acceleration in credit growth built on the liabilities side of the Fed’s balance sheet: Given a stronger growth outlook and a likely easing of financial sector regulations, we see a high likelihood that banks could start lending out their substantial excess reserves, further fueling the macroeconomic pressures on inflation. Stronger wage and price pressures fueled by a sustained economic recovery: We see the ongoing strengthening in US and global growth as likely to fuel stronger wage growth and consumer price inflation. This would either lead the Fed to accelerate the pace of rate hikes, or result in a rising term premium as markets anticipate inflation running ahead of the Fed. The reversal of QE marks an important chapter in economic policy in the post-GFC world. Since 2008 the expansion of the Fed’s balance sheet–mirrored by QE in the eurozone, Japan and the UK–has arguably been the most dominant force shaping the global economic environment. The impact of Fed policy on real economic activity worked mainly by engineering a sharp rebound in asset prices and supporting large fiscal deficits at a time of weak domestic private demand. At the same time, however, massive Fed intervention in financial markets created substantial distortions. 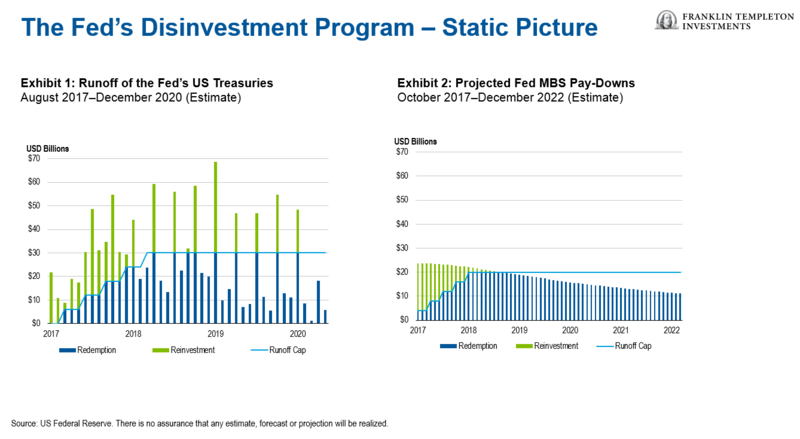 The Fed’s disinvestment program introduces caps for maturing USTs and mortgage-backed securities (MBS) to limit the size of redemptions per month (the amount beyond the cap would be reinvested). According to the disinvestment scheme, the caps will start at US$6 billion for USTs and US$4 billion for MBS, and would rise in equal steps every three months, until they reach US$30 billion for USTs and US$20 billion for MBS (by October 2018). If everything goes according to plan, by 2020 the majority of the tightening will have been achieved. While the actual trajectory remains uncertain, the Fed’s balance sheet would shrink by US$1.3 trillion over the next three years, with Treasuries and MBS redemptions in 2018-2020 totaling US$700 billion and US$630 billion, respectively. Whatever the end point, the Fed hopes this unwinding will have little market impact, if any.4 Most investment banks’ analysts seem to agree, and project only a modest increase in yields, with the 10-year UST yield rising by around 50 basis points. Quantitative Tightening II: Who Will Buy What the Fed Won’t Buy? The simplest (and safest) scenario would be for the Treasury to reduce the outstanding level of public debt correspondingly: The Treasury would transfer money from its cash account at the Fed to cover the maturing debt. An equal amount would be removed from both sides of the Fed’s balance sheet, which would shrink by the amount of debt maturing. This, however, can only happen if the stance of fiscal policy results in a fiscal surplus, allowing a reduction in the debt level. 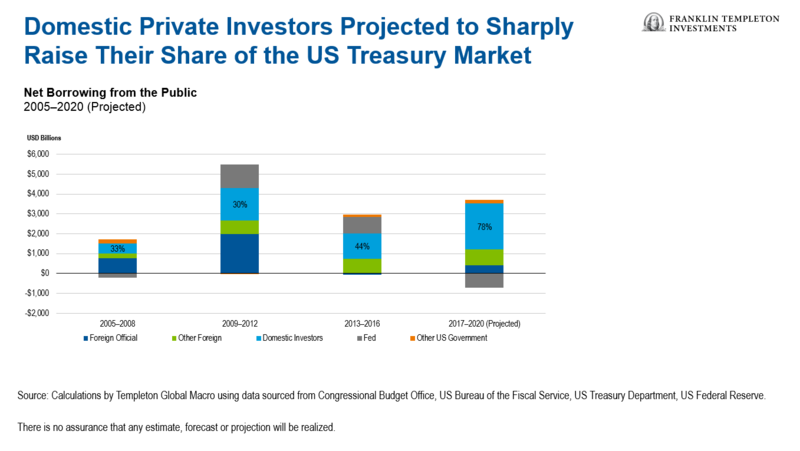 In practice, Treasury issuance will likely rise substantially over the next few years. The Treasury will need to issue new securities to cover those maturing (plus additional ones to finance the deficit). The new securities could be purchased by the domestic public or by domestic financial institutions, or by foreign buyers. Consider domestic buyers first: To be induced to increase their demand for USTs, both financial institutions and individuals will need to be enticed by a lower price, i.e., a higher yield. From a bank’s perspective, USTs are not the same as cash reserves. USTs carry much higher duration risk, which a bank can hardly ignore especially in an unwind scenario. Proponents of the savings glut theory say less price-sensitive foreign investors will step in. The data, however, shows the opposite: Demand for perceived safe-haven assets has waned, though it has been concealed by the effects of QE across the major advanced economies. Our model therefore shows that even if demand from foreign official buyers recovers somewhat after being absent for the last four years, a much larger share of UST supply would need to be absorbed by price-sensitive investors, including private foreign buyers but especially domestic investors like banks, mutual funds and pension funds. This would significantly increase the likelihood of sharp snapbacks in yields. This transition could be exacerbated by negative feedback loops as players reassess their interest-rate forecasts.5 This analysis implies that even if US economic activity holds at current lackluster levels and inflation pressures remain subdued, the Fed’s unwinding should trigger a meaningful rise in bond yields. Discussions of quantitative tightening tend to focus on the asset side of the Fed’s balance sheet. The liabilities side of the Fed’s balance sheet has attracted much less attention–and yet it hides the potential risk of a sudden credit boom–and faster inflation. The Fed has indicated it wants the unwinding process to be smooth and gradual; as only around 40% of the Fed’s assets will mature over the next five years, and the central bank wants to avoid outright asset sales, the pace at which its balance sheet will shrink has a natural limit. Excess reserves will therefore remain extremely high over the next few years. A well-entrenched economic recovery could set the stage for the money multiplier and money velocity to move back toward their pre-crisis levels. The Fed and most analysts, therefore, expect that money velocity and the money multiplier will rise as monetary policy normalizes. But we see no guarantee that they will rise at exactly the pace that would make QT consistent with stable or moderately higher inflation. Just as the decline in money velocity and the money multiplier proved faster than expected in the GFC, their rebound could be faster than expected in the recovery phase. The US Treasury recently issued a report proposing a number of changes to the financial sector’s regulatory framework, including on capital requirements, liquidity rules and banks stress testing. These proposed changes reflect concern that the tightening of regulations post-GFC has been excessive, with an adverse impact on credit growth that has especially hurt small and medium enterprises and reduced economic growth. The proposed financial deregulation aims at enabling faster credit growth and greater economic dynamism. The majority of the proposed changes could be enacted directly by the relevant regulatory agencies, without passing new legislation in Congress. This implies a quite high probability that financial deregulation will in fact take place, even though implementation will take time, stretching well into 2018. Inflation remains well below central banks’ targets in both the United States and the eurozone, and has remained subdued in most other advanced economies as well, even though economic activity has picked up momentum. Low inflation partly reflects muted wage growth: In the US, even as the labor market has returned to full employment, average hourly earnings have only increased 2.9% y/y as of September 30. Globalization: The gradual integration of emerging Asia and the former Soviet Union into the global economy has vastly increased the available labor pool, so that the threat of outsourcing limits labor’s bargaining power in advanced economies. Technology: Advances in robotics and artificial intelligence have broadened the range of tasks that can be automated, compressing wages for low and medium-skills workers. First, if automation were playing such an important role, we would expect to see faster productivity growth and modest gains in employment; so far we have seen exactly the opposite. Second, while academic studies suggest that global competition (notably from China) has caused meaningful losses in manufacturing employment, services account for the bulk of US employment, and the majority of services jobs should still be less exposed to global competition. A similar debate has emerged on the relationship between prices and economic slack–the price Phillips curve. Here again views have converged on a consensus that the price Phillips curve has flattened due to a combination of technological improvements and intensified global competition. And here again, we believe the two pillars of the consensus view need to be taken with a pinch of salt. New technologies do seem to have helped reduce price pressures, in some cases by lowering production costs but, more importantly, by increasing price transparency and competition–think of consumers’ ability to quickly compare prices on the web. At the same time, however, these technologies have created winner-take-all dynamics in several markets, where a successful platform can acquire a quasi-monopolistic power. Global competition also appears to have contributed to reducing price pressures in advanced economies. But as emerging markets converge toward advanced economies, this impact will weaken: Wage levels have already been rising in large emerging markets, increasing their production costs. And since inflation tends to have an important global component, the rise in global growth and global capacity utilization should push up global price pressures, which in turn should impact inflation trends in the US and other major advanced economies. The fact that wages and inflation have remained unexpectedly subdued over the last couple of years should not lead us to think inflation can never come back; if we do not fully understand why the Phillips curve has flattened, we need to recognize the risk that it might steepen again. Both the Fed and financial markets seem to expect that the unwinding of the central bank’s balance sheet will be uneventful, smooth and with little market impact. In this paper we have argued that this will most likely not be the case. In fact, only an extremely unlikely combination of events could ensure a smooth and painless transition. In particular, we believe markets are underestimating the impact on UST yields. As the Fed reduces its demand for USTs, and as the Treasury increases supply to cover the fiscal deficit, bond prices must fall and yields rise to entice new buyers. QE reduced yields; its reversal will increase them. Our finding that domestic price-sensitive buyers will have to cover a disproportionate share of demand strengthens this basic point. To reduce the risk of disruption to asset markets, the Fed plans to reduce the balance sheet at a slow and gradual pace. By implication, however, banks’ excess reserves will remain extremely high for the next few years. This could fuel a sudden acceleration in lending, as both credit demand and supply respond to stronger economic conditions, and financial regulations ease. Price pressures have remained muted so far. This might not last. Wages for continuously employed workers are rising at a healthy clip; wage and price Phillips curves have flattened, but the arguments that they have permanently flattened fail to persuade us. Moreover, trends in wages and prices have a strong global component, and the global outlook points to greater stress in resources utilization and faster wage and price growth. Not all of these three forces need to come into play, but all have to be proven wrong for market expectations to be validated. We find this extremely unlikely–and definitely not a scenario to invest on. We expect the Fed’s unwinding road to be a long and potentially disruptive one for markets. For even more detail on this topic, visit our Global Macro Shifts hub page. Global Macro Shifts is a research-based briefing on global economies featuring the analysis and views of Dr. Michael Hasenstab and senior members of Templeton Global Macro. Dr. Hasenstab and his team manage Templeton’s global bond strategies, including unconstrained fixed income, currency and global macro. This economic team, trained in some of the leading universities in the world, integrates global macroeconomic analysis with in-depth country research to help identify long-term imbalances that translate to investment opportunities. This material reflects the analysis and opinions of the authors as of October 20, 2017, and may differ from the opinions of other portfolio managers, investment teams or platforms at Franklin Templeton Investments. It is intended to be of general interest only and should not be construed as individual investment advice or a recommendation or solicitation to buy, sell or hold any security or to adopt any investment strategy. It does not constitute legal or tax advice. All investments involve risks, including possible loss of principal. Bond prices generally move in the opposite direction of interest rates. Thus, as prices of bonds in an investment portfolio adjust to a rise in interest rates, the value of the portfolio may decline. 1. The wage Phillips curve measures the relationship between wage growth and labor market slack, and the price Phillips curve measures the relationship between prices and economic slack. 2. Source: International Monetary Fund, World Economic Outlook, October 2017. 3. We assume that Fed holdings of USTs and MBS are proportionally reinvested in Treasury bonds. For USTs, we used disaggregated data to separate out the mid-month and end-month maturities, given the different issuance schedule at these auctions. For mid-month auctions, 38.6% of reinvested USTs werechanneled into three-year securities, while at the end-month auctions, 29.5% of reinvested USTs were channeled into two-year securities (as per the Treasury’s auction schedule over the past year). Since the remaining securities issued at both mid-and end-month auctions have tenors greater than three years, they do not affect the analysis (over the relevant horizon). Additional assumptions were made on the liability side of the balance sheet regarding the growth of currency, required reserves and the capital/other liabilities category to back out excess reserves. 5. The BIS has highlighted amplification mechanisms in financial markets that pushed yields lower during QE. Potentially, these dynamics can easily reverse. For an example of such a mechanism, see a case study on risk management in German insurance firms described in the BIS paper “How Much Should We Read into Shifts in Long-Dated Yields,” Hyun Song Shin, 3/3/17. The iShares Barclays 7-10 Year Treasury Bond Fund (IEF) was unchanged in premarket trading Friday. Year-to-date, IEF has gained 2.55%, versus a 16.56% rise in the benchmark S&P 500 index during the same period.